Item # 142662 Stash Points: 1,497 (?) This is the number of points you get in The Zumiez Stash for purchasing this item. Stash points are redeemable for exclusive rewards only available to Zumiez Stash members. To redeem your points check out the rewards catalog on thestash.zumiez.com. Stay trendy with the American Stitched Scrunch Khaki Jogger Pants for boys. These bottoms are featured with a gathered elastic lower leg seams and thick elastic ankle cuffs. A wonderful blend of stylish modern features great for any wardrobe that offers an enhanced innovative edge to your outfits. 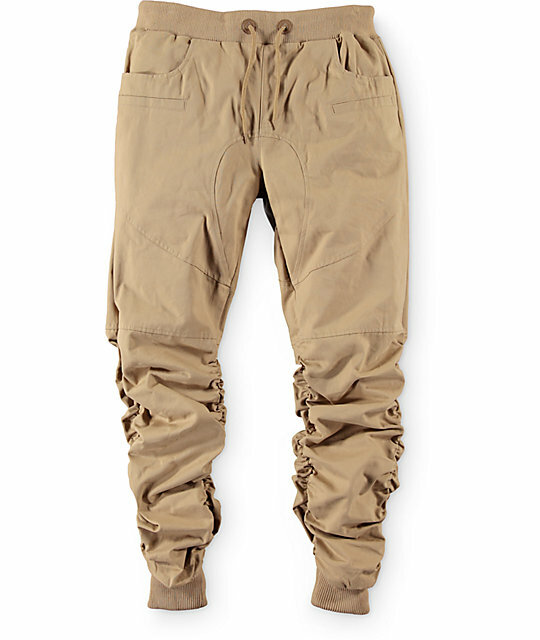 Scrunch Patched Khaki Boys Jogger Pants by American Stitch. Embroidered patches throughout front of garment. Ribbed moto detailing on front legs. Approx. 34" inseam, 9" front rise, and approx. 4.5" leg opening on size 12.